This last weekend I took some time away from skiing to make these beauties for Soccerchica. They are a Valentine's Day gift, so I hope she does not read this between now and then. 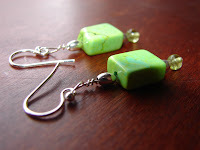 Details - Sterling Silver beads and wires with green turquoise beads. They were made in a cute shop called Baubles & Beads in Boyne Falls, MI. If you are there, you must stop in. Maybe some custom stitch markers are in my future? I can see how beading could become addictive. In knitting news, I ordered some new yarns from Loopy Ewe and Knit Picks. They should be here in a few days. I have some fun socks planned. . . I Started Tipsy on the drive up to Boyne on Friday and already have the leg done. 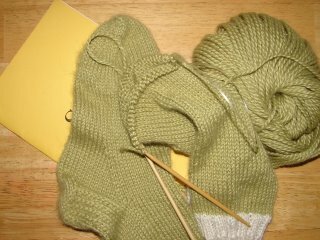 Now for the heel flap. They will be my current car knitting socks. My hope is to have one sock finished next weekend. With a four hour drive to and from Boyne, I need something that is light weight and easy to transport. When we got back home, there was 5 inches or more of snow on the ground! Now, most people would get home and have to shovel their walk and drive. Not us. Nope. We have the best neighbors in town. One of them cleared our drive and our walk while we were away. The mystery is which one of four neighbors did the deed. Hmmmm. So today, I am making four plates of cookies to take as a thank you. I lost my baking mojo at Christmas time, so hopefully the cookies won't be too bad. The goal is to thank them, not permanently damage their taste buds. JJ, found this . . . thought you might like it. The cute play on words and comments are funny. 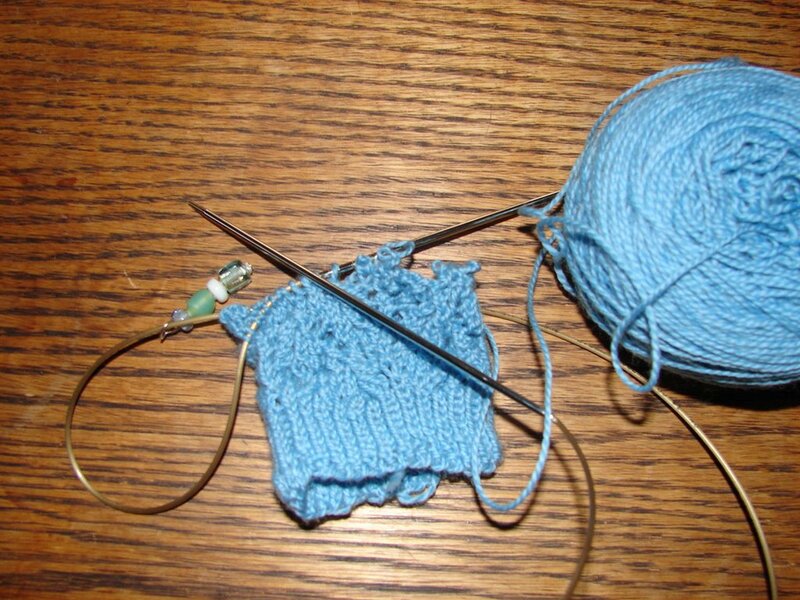 Life beyond scarves.... if you know how to knit,then you know 50% of the process. When you're ready to move on and learn the other half of knitting, just watch this video with needles and yarn in hand and you will be on your way. Yes, mys sister is hooked. I officially got the "Teach Me To Knit" call about a week ago. She is having trouble with her computer opening the videos at Knitting Help, so I thought I might help. 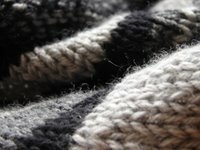 Note, Knitting Help is a great site, and the problem is with JJ's computer, not Knitting Help site. No, but I have chosen a pattern for the yarn. 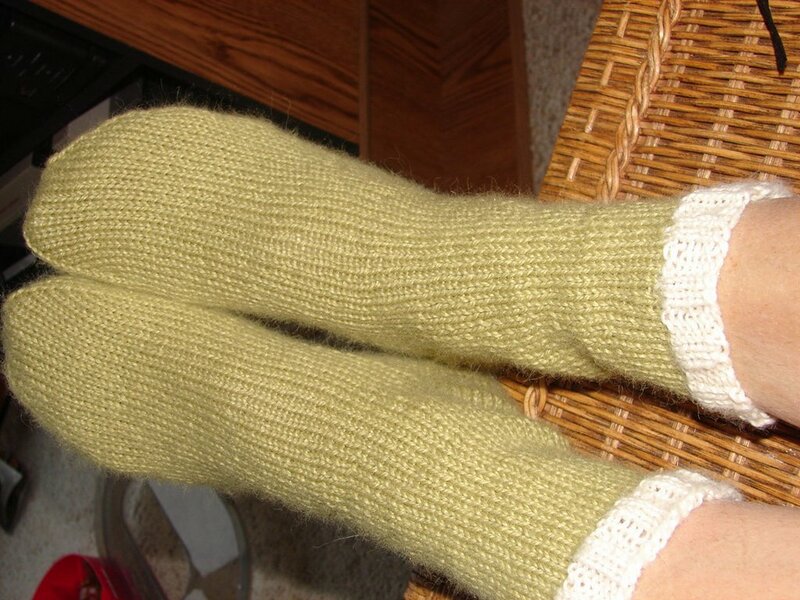 It is the Tipsy Knitter socks by Katherine Matthews from Socks, Socks, Socks. The pattern looks fun, plus how could you not love the name. I'll post a picture on Monday. I have a very busy weekend planned, so no posts until then. Have a great weekend! Hurry, Throw Me A Life Preserver! Hopefully, after my dip in the frog pond, I will come up with a refreshed perspective on this sock yarn. I first saw Whitby by Nancy Bush here and here. They each inspired me to get try knitting these socks. Well, Mr. Rogers wasn't singing very loudly, because I rushed right in up to my knees. Bought the yarn (I chose a Louet Gems yarn, thinking I would stick to pattern specs) and cast on . . . with the wrong weight yarn. But, I was adventurous and thought I could forge ahead with some minor adaptations. Riiight. So, began my first lap in the pond. Tried this line of thinking for a second time, but just couldn't find a grove. Lap two. I cast on for Zonki by Pepperknit next. I think this is a super pattern. Clearly written and fun to knit. Definitely thought this was the "one" for this yarn. But the yarn didn't love this pattern and fought me every step. Also, LM decided to "try knitting" and got in my knitting bag. If you look closely in the picture, he really did me no favors, leaving more stitches off the needle than on. It must be an omen. I am beginning to think this yarn loves the nauseating spin of the ball winder and doesn't want to be a sock. Thus begins lap three. I'm getting in the pond . . . here I go . . . Dive! P.S. ~ As yarn is my witness, I will not let this defeat me. 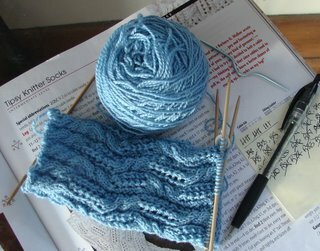 Zonki will get knitted in another yarn that is worthy of the pattern. Whitby will get knitted in the correct weight yarn. And I will slow down giving my fingers a chance to lose the puniness so I won't have to jump back into the pond. I will not do another lap with this yarn. It will become a pair of socks. This morning, I lay in bed for several minutes. I was just listening to our household morning sounds. There was no TV spitting out morning PBS children's shows. None of Mom's snoring from LM's room-turned guest room. No "Auntie Trixie, are you . . . ?" from Lula-belle (3 yr. old niece). The rythmic thump-thump-thump of a soccer ball being dribbled by Soccerchica is gone. No hot coffee already brewing, with a steamy cup waiting for me on the counter. I'm still waiting for the horror of that one to pass. Things were strangely *pause* quiet. The only exceptions being RM getting ready for work and Grandma Kitty asking for her morning kitty treat. All my house guests are gone. I miss them. I miss them. I miss them. I miss them for the above reasons and many more I would never list here. So I got up to face the day. Today will bring me many opportunities. But today will not bring them back to me. They have flown back to their respective lives, rejoining their families and daily routines. I dreaded them coming, but found I liked them here. (JJ, I know you read this - don't get a big head). I miss them. We had fun sitting at the kitchen table ripping apart used sweaters (I can hear your collective knitters gasp) for felting. There is something to be said for three generations of women crafting together. Opportunities to just be ourselves and create an object/art/trash - depending on who is looking at it - that will go on without us. A piece of ourselves to be shared with others. What an opportunity. So, I will use today as an opportunity to cherish all my family, far and near. An opportunity for the little family unit I have left here in Michigan to make memories and objects/art/trash to give as pieces of ourselves that can live on. My hope this that the objects/art/trash give their owners as much joy in using them as creating them has given us. Please create your own opportunity today. Last summer JJ received a purse similar to these from me. I think she liked it, because she wanted to make one while she was here. In our chat, I told her about my newest project, a felted bag made from an old sweater. It's fun to take something old and find a new use for it. JJ thought this type of project sounded right up her alley. 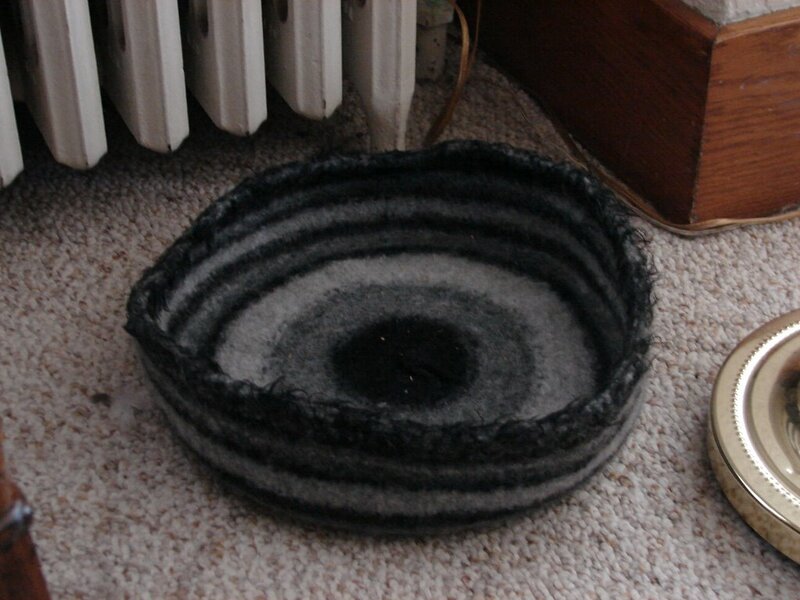 Out we trotted to Salvation Army, bought some wool sweaters and she took her first drag of sweater felting. Yes, ladies and gentleman, she's officially hooked. Here is what she got accomplished in just a few hours. Note the handles are only pinned in, thus causing the two dimples. She will be hand sewing these in later. Oooooh it was good. I think she could become a fiber addict. In the beginning she will stick to recycled sweater felting. Next she'll whisper that she wants me to teach her to knit. Which I will graciously do *note shifty eyes*. I might even give her the first hit skein of alpaca for free. After that I know it won't be long before she's calling me late at night about how to execute a certain type of stitch. First it will be a simple yarn over, then maybe a k2tog then . . . bam. . . it's a skpsso combo. Yes, my pretties, she's all mine. After that, I can pretty much guarantee we will hit a LYS together at every chance we get. RM says I am enabling her and now can be labeled her yarn pusher. Yea, so what's he really trying to say? Haven't posted about this or this for a while. I am having gauge issues. I hate gauge issues. Oh, and I hate reading directions correctly issues. And executing simple M1 issues. And project attention deficit issues. And . . . Need I go on? This project has not been blessed by the knitting goddess. I like to take my time to do it right. And so I like to take my time. Well, I did not listen to Mr. Rogers on this one. I will be tinking back to before the increases on the front left panel. Ouch. That's 30 rows. Guess I'll slow down a bit. In other news, my family was here for a visit last week. We had fun just spending time together. The two older kids played and I got to hold JJ's little boy (JJ is my younger sister). What is it about a baby that instantly sooths your muscles, forcing you to relax and allow time to gently pass? Needless to say I got little knitting done, but do have a surprise to post tomorrow! Finished! Oh, yea and . . .
Darn, all that and they look good too. 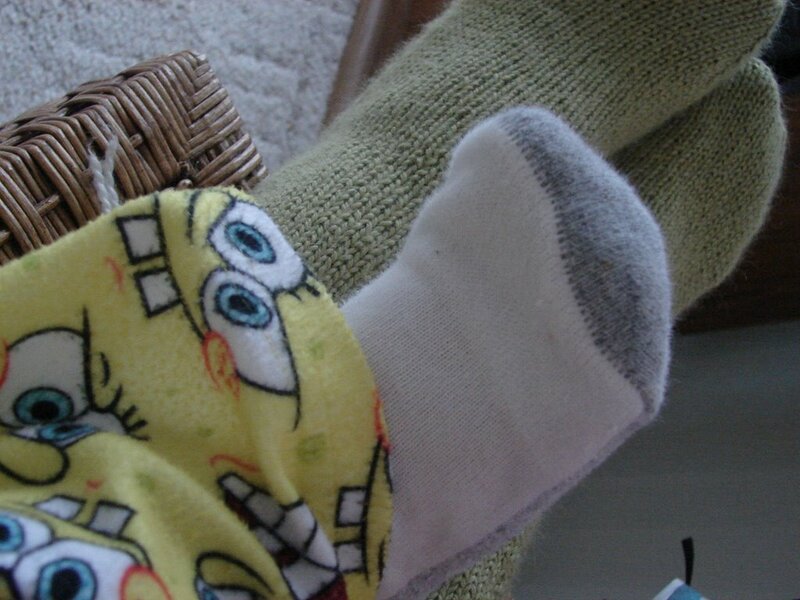 What functional and pretty little creature’s socks can be. I'm a little grossed out at the whole half-a-pint-of-sweat-a-day thing. I posted last about these babies here and here. Notes: I started these socks on DPN's. On a whim switched to magic loop a quarter of the way through the first leg. It's much easier to knit in the magic loop method with this yarn. I saw a sweater out of this color in LYS and loved it. Not loving the color as socks, but what the hey. They are by far the most comfortable thing I have ever had on my feet. I. Love. This. Yarn. Note to self - shave your legs you unkempt creature. Here is my little helper during the photo shoot. I think his commercially made socks will absorb more sweat that mine, eh? Off to soak and block the socks. I just hate to take them off. Now on to a new pair of socks. Hmmmmm, what shall it be? Just a quick progress shot of the Betweener socks. I can see the finish line. These were begun back in October, 2006. Have I said this before? I love this yarn. Alpaca and Silk . . . yummy. Plus, I am knitting them on US 5 needles. So, I would say they were a quick knit (if I would work on them more). Well, I have decided that I want to get the smaller projects off my needles. There are a few sweaters that are beckoning me to knit them. I have decided that I might start to exercise some time soon, in the future. I fell off the wagon before Christmas and need to get back in the routine. This looks like fun. 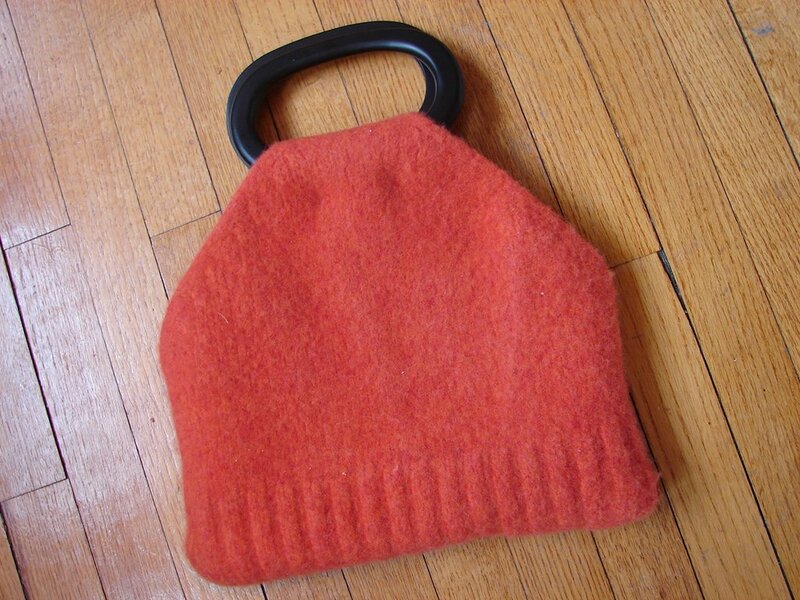 I found it at Yarn-A-Go-Go (a blog I have lurked many times - it's great). Spring Break is less than three months away and I will be going somewhere warm! Can you believe I forgot to post about my Christmas gift from Mom? Usually I get a great pair of PJ's. I have about twenty pair of PJ's now. How many does she think I need? But this year, Mom went out on a limb. She tried something new (must be the Arizona air). Well, I like this limb and she can stay out there year after year! Yes, friends . . . she got me a swift and a ball winder! Now that's a good gift. Make that a great gift! Thanks Mom! I don't know the brand of the swift, but it is all wood. Each join is hand-tied and it turns so smooth. When I opened it, a noise came out of my mouth that sounds like what those teenage girls make when they see Kelly Clarkston in concert, etc. You know what I mean, that high pitched irritating noise. Yep, I made that noise. I was too excited to care. At my age, there should be no school girl squealing, except when . . . oh never-mind. The ball winder is by Royal. 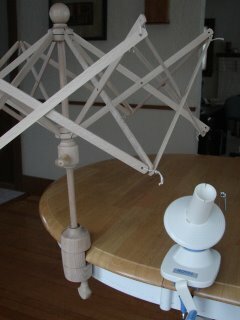 It doesn’t seem to clamp tightly to my table, but that is my tables fault, not the winder. The table is oval and the lip is too small for the clamp. But I have other tables/places we can enjoy winding fun. Both were taken on their first test drive last night. They work beautifully! Each was so easy to set-up and take down. RM says it’s my Mom’s way of enabling my “yarn habit.” Ok, so what’s his point? Now I'm off to get all wound up . . . all my stash yarn that is. Kitty Pi that is. Grandma Kitty is 72 in people years. She moves slow, eats very little and takes all the "loving" the kids dish out. I think you can determine this by the set of little hands and bushy hair in picture. Our house is drafty. To give her a cozy place to sleep I wanted a soft bed that would hide all the cat hair she so lovingly produces. It had to be large enough to hold her, yet small enough to fit by her favorite register. Priced them a local stores and decided the cost was too high. So, out came the knitting needles. I found Kitty Pi Pattern by Wendy Johnson and decided I could knit this up quick. 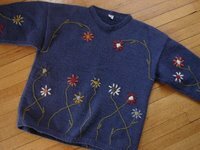 Using Nature Spun 100% Wool in three colors, I cast on Friday and finished on yesterday. This includes felting and blocking! 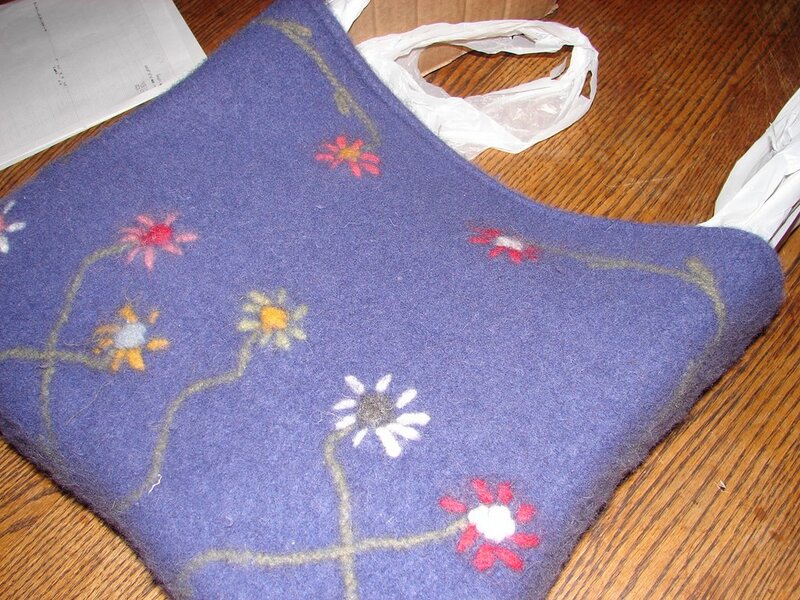 This is a photo of the piece before felting. Wendy's pattern calls for bulky yarn. LYS did not have any (another story), I just knit with two strands together. Now, let me tell you, this knits up very fast. 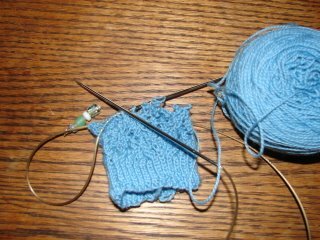 The pattern calls for US 11 needles or larger. Next time, I will use US 13. Grandma Kitty needs a slightly larger bed for upstairs. These are so quick she may end up with a Kitty bed in each room. For the next one, I'll try yarn from Knit Picks. Not sure if I want to use the hand-dyed or if I want to work a stripe pattern. Letting that marinate right now. Note - This was a post that had been drafted back on November 13, 2006. I was doing some New Year cleaning and found it. Now I am finally posting it. 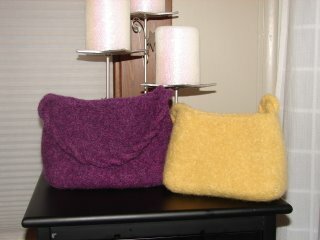 Here are two Sophie Bags that were completed before Christmas and given as gifts. Unfortunately, the other three were given away before any pictures could be taken. Take my word for it, they were breath taking. *she giggles* Actually, they were exactly like these two, but in different colors. Notes: The Heather color did not felt as well as the regular wool (note the size difference). But both are nice to work with and these knit up quick. I bought sparkling vintage pins for the front of each purse. Searching for just the right pin was the fun part. It's tough to match a purse color and loud tacky pin to each recipient’s personality. 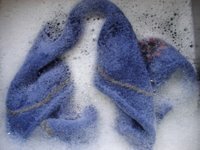 I loved this post from The Daily Purl and wanted to share it with you. Always feeling that the journey and the attempts were as much fun as the end product (flaws and all) but never able to put it into words, I found that she voiced this feeling beautifully. Kudos to The Daily Purl. I'd Like to Think I am Full . . . While we were up North this week, it was necessary to take a break from skiing. So a drive to Traverse City was in order. One of my favorite yarn shops is there. Called the Lost Art Yarn Shop, it boasts a large selection of yarns, patterns, and needles. Here is my score! Yarn: Jo Sharp Alpaca Kid Lustre in Ripe (the light pink) and Vintage (Wine). The third ball is Jo Sharp Rare Comfort Kid Mohair in Rosehip. I bought these to knit Flora. 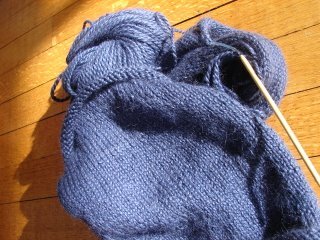 This will be the first time I have knit with three strands held together. Should be fun! BTW ~ I removed several pictures of my kids off Trixiestix. This was a personal choice due to some discussions with RM that scared the living day-lights out of me. Of course it was about children and the internet. Now, I don't think that knitters would ever do anything; it's the psychos that would stumble on them that scared me. So, I will insert new pictures as available. Thanks for understanding. Well, it's 2007. Yup. Working on a great way to begin the New Year. . .
LM to sleep in his own bed. All. Night. Long. Soccerchica to get her home work done before she watches TV, checks computer, eats a snack . . . you get the picture. Trixie to knit more and worry less. I am not going to go on about what I will or will not do this year. Always screw that up, so no sense in making you promises I can't keep. Though, I will suggest that. . . If I want to buy yarn I will. If I want to start a new project, I will (even if it does mean I have fifty projects on the needles at once). 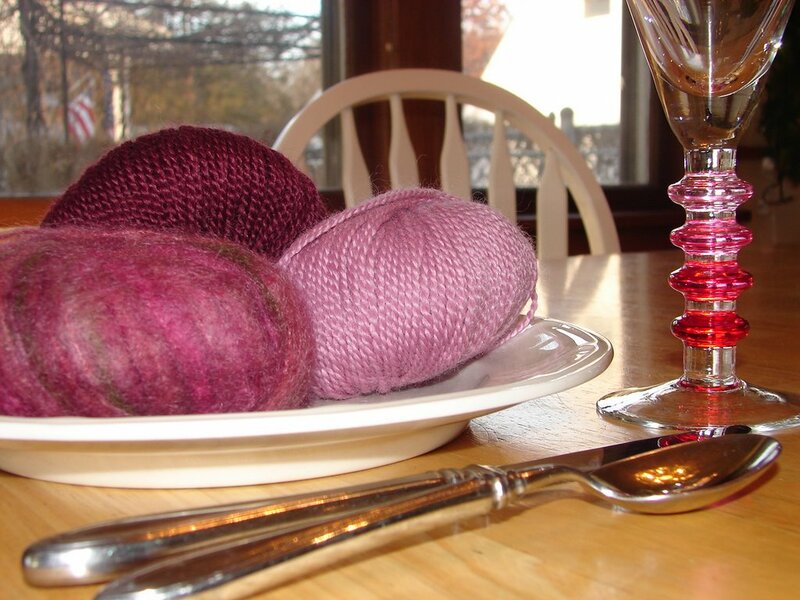 If I want to knit Christmas gifts next year, please give me a BIG glass of wine so I will forget that suggestion. If I want to go on a yarn diet, I will. If I want to take a break from knitting, I will (yea, riiight). 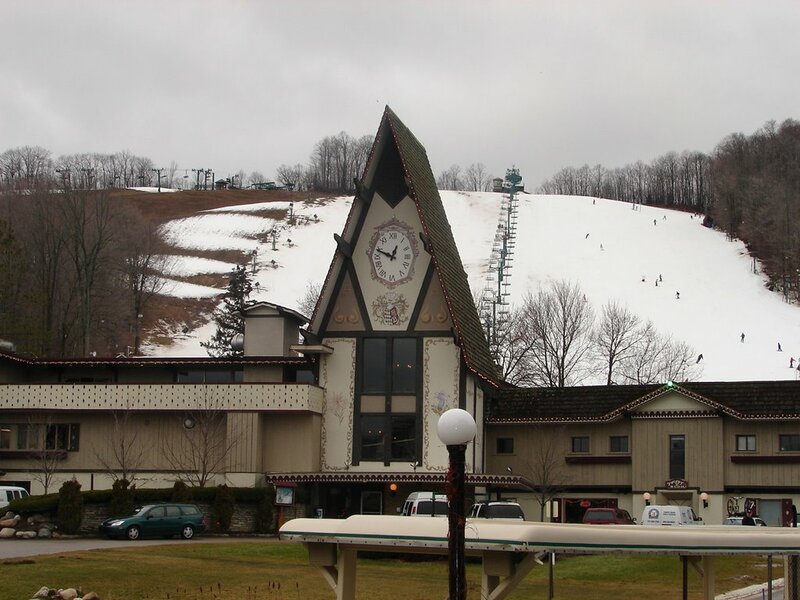 We have returned from the great WET North (notice green grass in picture and snow only on parts of ski hill). The temperatures were in the mid-30 to 40's. Mother Nature even found time to send down some rain while we were skiing. Now, I am definitely a fair weather skier. So, we spent a lot of time in the water park. This was not the way weather should act above the 44th parallel. It should be cold with lots of snow on the ground. Fun was had by all, so no great loss for us. I'll let you in on a secret, we will be back up at Boyne in two more weeks, there should be snow then. Oh and there was some knitting done too.